Stainless Steel in Pipe Mini-Baffle! GMan's GPop for ALL Exhaust Pipes up to 2.5" I.D. Missing some Torque but have great sound??? Want more Torque without reducing current sound??? GMan's GPop is designed to add torque to any aftermarket exhaust currently without baffles. The GPop installs in minutes using the same hole that held the original baffles. The GPop allows removal of your aftermarket baffle to increase sound yet keep torque for a crisper throttle, more power and potentially better fuel mileage!!! GMan's GPop's are fully adjustable for all size of exhaust pipes up to 2.5" ID. Simply install a few inches in from the end of the pipe. Turn at an angle for pipes smaller than 2" ID. Adjust the angle of the GPop based on the feel of the throttle. It's as simple as that! 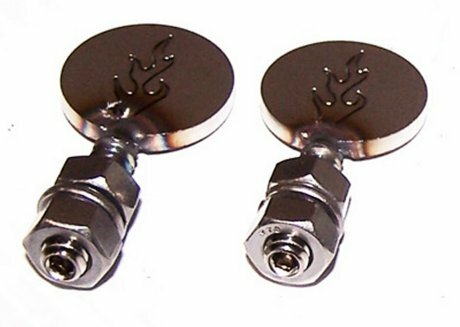 GMan's GPop's are Laser cut Stainless Steel with a High Performance Flame Design for Power and Looks at the same time. The GPop DOES NOT require retuning or rejetting of your setup, yet adds torque thus throttle response where missing baffles were present. The GPop is form and function at it's very best! The GPop Kit Comes Complete with Two(2) GPops, Four(4) Washers, Two(2) Jam Nuts. Review: Direct bolt in. GPop does exactly what is stated above. More low end torque. Review: I added the GPop to my exhaust after the Jetting service and the exhaust tone is great. Review: I needed some extra back pressure on my Yamaha Warrior XV1700 with Roadburners pipes. I had lots of Popping and RPM surges at idle and low speeds. This has apparently cured that problem. Give them a try. Does not lower my Decibels and I am happy to have loud pipes still! Review: The best money I've spent on the ole boy. Most cost effective, and simplest upgrade anyone could ask for. Took me 15 minutes to install, for an instantly noticeable improvement. Would never have thought such a simple device could provide such a dramatic result. Review: I have looked high and low for these type of Baffles. Construction is Excellent. GMan is the Go to Man for Lolli-Pop Baffles.